If your reloading bench still consists of sawhorses and wood, well it’s about time you got an upgrade. With the best reloading benches you’ll be more productive and have greater flexibility with the setup. 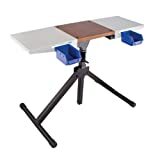 Equipped with a good reloading bench you can use it for a variety of projects such as a press stand or a means to mount your press. You may also use the bench to store your reloading gear among other possibilities. 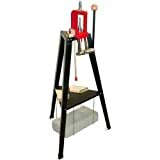 If you’re unsure of what reloading bench to buy, I hope the reviews and information here will help. 5 What is the Best Height for a Reloading Bench? Portable reloading benches are often too small, but Lee made sure this one had a lot of space without sacrificing portability. 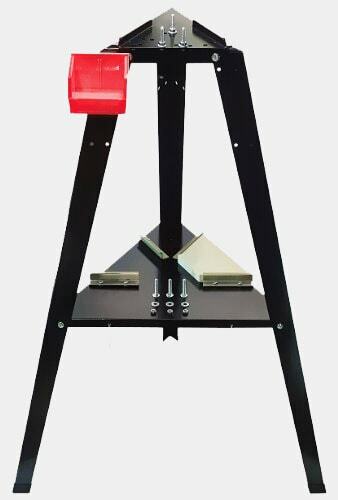 This reloading stand has steel powder coating for extra strength, and it positions your press at the proper height. The stand has three sturdy legs that ensure the unit is stable even if the floor is carpeted. All three legs have mounting holes so you can expand its capacity with accessory racks, shelves and bins. The stand includes a tool storage that you can attach onto the bin. The Lee stand also comes with a metal shelf with a couple of bench plate receivers. With these you can store additional presses and other items. The Lee Bench Plate System is installed at the top and allows you to use every type of Lee metallic press. While the bench comes with a lot of features it’s very easy to use. The Lee reloading bench has a rather spartan appearance but as this review has shown it comes with many useful features. For a lot of people, being able to use it with presses is the best feature. Lee did a remarkable job with this reloading bench, providing a good deal of functionality and increased productivity. 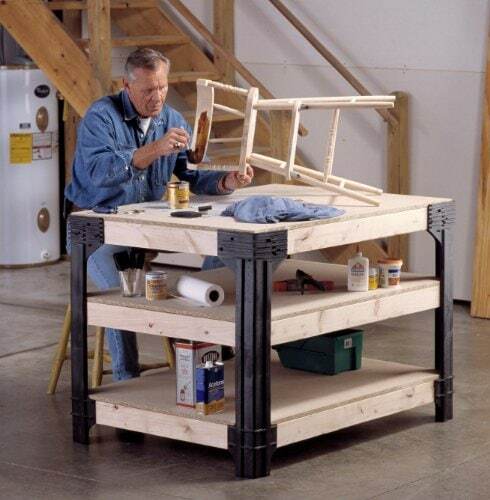 Its solid construction and capacity provides a good alternative to cramped reloading benches. Sometimes the best reloading bench is the one that you build. Well with the Hopkins reloading bench that’s what you get. The Hopkins reloading bench comes with all the fittings you’ll need for a custom reloading bench. If you’re into DIY or have very particular needs then you’ll find the Hopkins ideal for getting the configuration you want. You can customize this bench up to a width of 4 feet, a length of 8 feet and up to 36 inches high. You only need to do 90 degree cuts so assembling is not that difficult. No matter how you configure the bench, expect it to last a long time as the parts are made of durable, heavy duty materials. All the materials are resistant to solvent and impacts, making them suitable for heavy duty applications. 6 shelf links and 4 workbench legs are included. 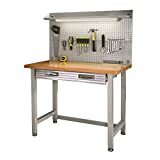 Obviously this bench is not for beginners, but if you’re good with tools and need a custom reloading / workbench, the Hopkins is worth a look. 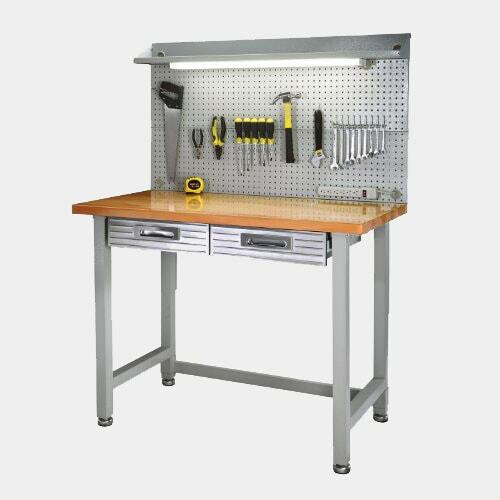 If you are the type who likes to build and customize stuff, the Hopkins workbench will satisfy your needs. The heavy duty components means you’ll be able to use this for years. The Seville Classics has one of the best reloading bench setup configurations around. It has a 23 hook pegboard, cantilever shelves, a fluorescent light and 2 storage drawers. The work surface is built from 1/2” thick hardwood so you can expect to use this for a lifetime. Once you’ve got the workbench ready you can place all your tools on the hooks so they are always within reach. The bench works great as is, but you can adjust the leveling feet to suit your preferences. The bench drawers also have ball bearing glides so they slide smoothly. The drawers have a couple of liners so the objects inside don’t move or create noise when you open and close it. This reloading bench also doubles up as a workstation with its fluorescent light and power strip. The Seville reloading bench frame is heavy duty steel and its drawers are fingerprint resistant so it won’t leave smudges. The materials have powder coated finish so the parts don’t corrode. Detailed instructions are also provided to help you with the assembly. The Seville Classic is a well-designed reloading bench, made from heavy duty materials and with pleasing aesthetics. If your workspace needs a makeover this reloading bench will definitely help. If you don’t want to settle for a cheap reloading bench that won’t last, the Platinum Series from Frankford is what you need. This is a spacious reloading bench that is easy to fold once you’re done using it. The work area is big enough to handle different configurations, and the provided storage keeps your items organized. This reloading bench has a durable platform that keeps the bench rigid and steady when unfolded. The reloading bench height can be adjusted so you can use it sitting down or standing up. 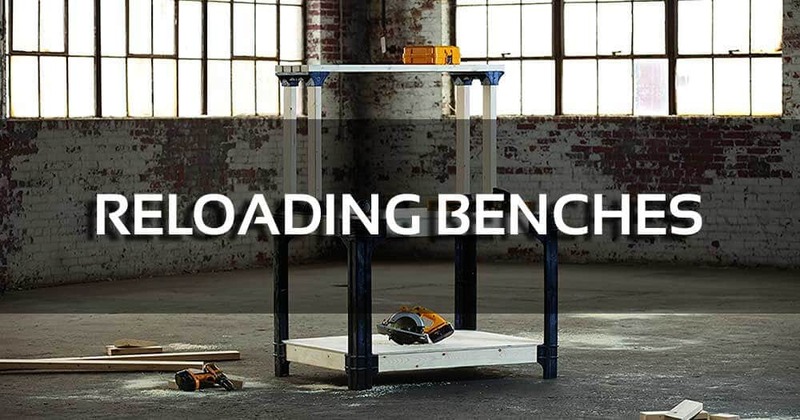 This provides you with greater flexibility compared to other reloading benches. The bench’s middle section is made of wood, allowing you to use it for powder measure, press mounting and using other tools. The compact dimensions make this bench an excellent option if space is at a premium. 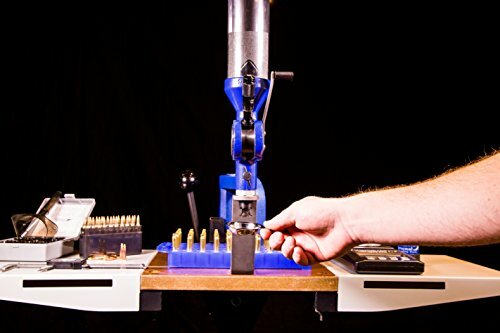 The tabletop width can be adjusted from 13 x 12 inches to 39 x 12 inches so you can apply different types of reloading procedures. The Frankford Arsenal is easy to set up, has a large workspace and provides ample room for your stuff. That’s pretty much all you need from a reloading bench and you get that here. If space is not issue, get a large reloading bench with lots of workspace. The more space available, the easier it will be to organize your reloading blocks, powder measure, press, bullets, brass and powder. You also need room for a micrometer, case trimmer, powder scale and other ammo accessories. All of this requires space so a sizable reloading bench is ideal. Some of these reloading benches are foldable. That is a good option if space is limited and you don’t want the bench in the way when you’re not using it. Look for a reloading bench with storage bins where you can keep small tools and other items to keep the workspace uncluttered. Other reloading benches have pegboard hooks so you can hang your tools there. Make sure also that there is enough space around the bench for you to move around comfortably. Your reloading bench must be able to cope with the reloading pressure. Make certain you don’t set the press at the wrong area as the bench might tip over when you use the press. You can avoid this situation by using a sturdy reloading bench, one that’s designed for presses. Have some paper towel strips close by as they’re good at removing dirt and grime. It’s a good idea to use pieces of wood and C clamps to keep your presses in position. This allows you to put the press anywhere on the bench. If you don’t have a drill yet it’s about time you got one. With it you can polish, chamfer trim and perform other tasks. All tools need some maintenance and that includes the press. If it’s not performing the way it used to, that’s a sign some clean up is required. Don’t put ammo in flimsy plastic bags. Buy ammo boxes and store them properly. Your best reloading bench ideas will only work if you have the right bench for the job. You’ll be using the reloading bench for a mounting press and put a lot of ammo, powder and other paraphernalia on it. The work surface must be made of heavy duty steel or wood to handle the pressure. Some reloading benches have bins or other containers. You’ll need storage to organize your stuff so they’re easy to find. A lot of these reloading benches have drawers, and they can make a huge difference if you work with a lot of tools. Just make sure the drawers have ball bearing glides so they don’t make creaking noises when you open. In some cases you may prefer to reload standing up while in other instances you may like to do it sitting down. In these scenarios you’ll be better off with a height adjustable reloading bench to customize your needs. Some of these benches come with working lights and other extra features that aim to make your work easy. However it is up to you to decide if the extra features are worth it or not. A lot of reloading benches are mostly assembled so you can get to work right away. Others however, can be customized so you can build the exact reloading bench you want. These reloading benches come with fittings and the necessary hardware. There is no lumber provided since you will decide what type of layout the bench will have. So is the build your own reloading bench right for you? If you’re new to reloading you are probably better off with the fully assembled bench so you can focus on reloading. If you have experience, a build your own may be better. What is the Best Height for a Reloading Bench? There is no right or best height for reloading benches as it depends on individual preferences. Some like to work standing up while others like sitting down. Only you can determine the best height by adjusting the settings until you’re comfortable with it. A reloading bench goes far in terms of building up your productivity and improving your output. There is no need to put up with sawhorses anymore when you can buy a real workstation bench. I hope the information in these reviews was able to help you. I believe that all 4 reloading benches here are of exceptional quality, but if I had to pick a winner it would be the Seville Classics. Simply put, the Seville is a durable, easy to set up and very serviceable bench. The hooks, adjustable level height and solid work surface all contribute to make this my number 1 choice in this best reloading benches list.